I just had the pleasure of finishing this book. I know, it’s crazy. I’m such a hopeless romantic, and I love Pride and Prejudice, it’s surprising that I have waited this long to read Persuasion. And of course, this won’t be a surprise to anyone, I love Captain Wentworth. The strong, silent type always get to me. This book centers around hope. Of course, hope in these situations, can be a bad thing. In fact, usually it doesn’t work out at all. However, it is nice to read (albeit fictional) about being hopeful in those situations, and having it work out. I love the way Austen always make you think. Mr. Elliott (the cousin) is courteous, friendly, and most amiable. It turns out, he had an ulterior motive the whole time. Similarly, in Pride and Prejudice, Mr. Wickham turned out to have less than worthy intentions. Also, the people she questions, in the end, those characters are the most honorable ones. Next Post Bucket List: Travel the World! I love Pride & Prejudice! I am pretty sure I saw this movie – Persuasion. But right now I cannot remember the plot. I also like Emma and Sense & Sensibility. 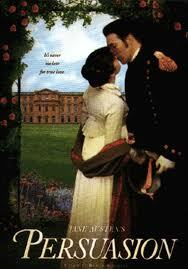 I read 3 or 4 Austen novels from her complete works, having read and loved Pride & Prejudice before. The books ran together, and I’m determined to try again, spaced out to do them justice. Have fun reading them! I’m sure if you loved Pride and Prejudice, you will love the rest of them!